Frequently, you will find yourself creating a same IF function (or any other function) over and over and over and over… So why don’t we just create the function ONCE and then keep re-using this function over and over and over…? Read more to find out how to build your own custom function exactly fitting your needs. At the same time, you know that the formula you would use for the new [Fruit] and [Second Word] columns would be used number of times in the project (or in other future files). 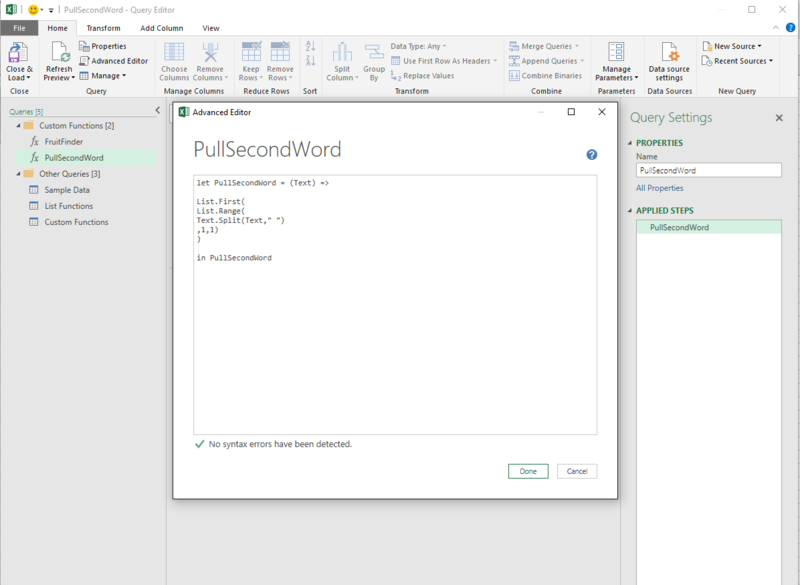 So you are thinking about creating custom functions “FruitFinder” and “PullSecondWord” which could be re-used over and over. More about IF functions here and here. Notice the custom “FruitFinder” function we are about to create. More about List Functions here. Now, let’s have a closer look on what you see. Red items are opening/closing lines around the function which you would normally create via “Custom Column”. 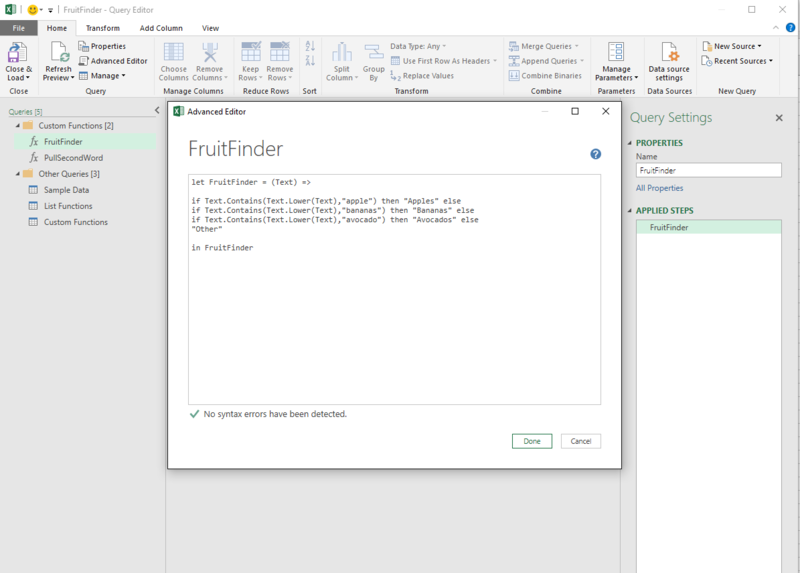 I always match the name in “let FruitFinder = (Text) =>….” and in “in FruitFinder” with the name of the this query (which is in fact the name of the custom function). It’s not necessary but it helps keep the things tidy. What matters at the end is only how you call the query (custom function) = Orange rectangles. Obviously, the last items are the green ones. 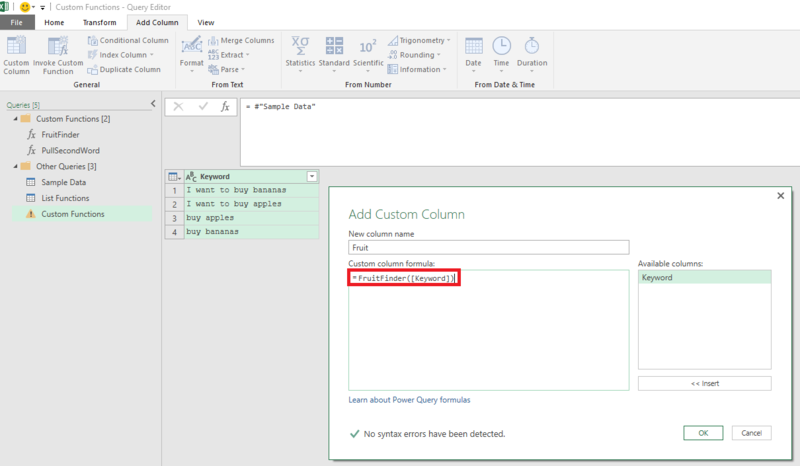 Those are the variables (for you “columns”) over which the custom function is going to be processed when being deployed via custom column in your main query. In our case, it will be [Keyword]. The new custom column using the function will then be written as FruitFinder([Keyword]). 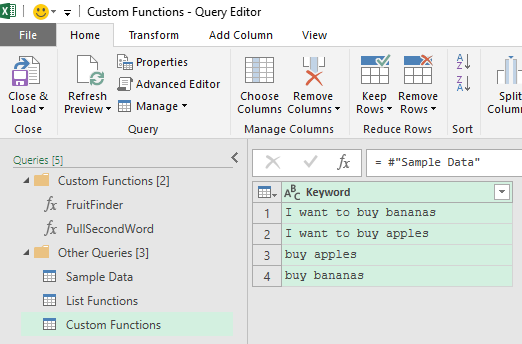 Basically, you tell FruitFinder to return values based on the [Keyword] column. You just follow the similar procedure to create “PullSecondWord” function as you just did with “FruitFinder”. Alright, so this is cool but what’s the point of creating the custom functions? If you change your custom function, the change is automatically applied to all the queries within the file (not across multiple files) in which you use the custom function. 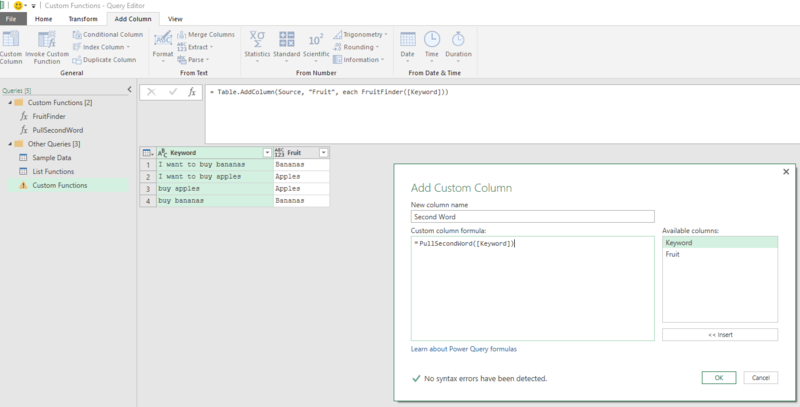 So in stead of fixing a custom column in 5 places, you can fix your custom function once.